First Thursday challenge at Thursday Night Smackdown: Use a fruit or vegetable that we've never worked with before. Hmm, I guess this means that the said fruit or vegetable must be "exotic". So, our very, very, ultra-very exotic vegetable is... [drumroll]... RADISH! Well, technically, we've worked with radish, but of the Asian daikon variety. We've never even thought of buying the cutesy red ones before; we would think, "What can we use those for?" 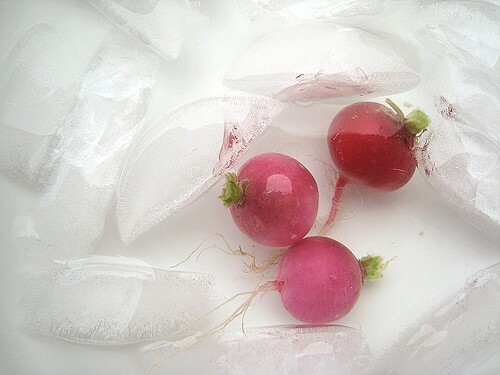 When we were installing our garden bed last year, the man who helped us (i.e., the man who installed the garden bed) told us that we can now grow our own radishes. Radish, supposedly, is very easy to grow and he himself grew up on radishes. I was left baffled, because our only usual use for daikon was in ma-kut soup. And radishes were quite light, so I can't quite imagine somebody growing big and strong (and the man was) on radishes. So, we picked up one bunch from the farmer's market. They're so cute! Here they are lined up like a happy family. The other part of the challenge called for using a recipe from a cookbook or magazine. 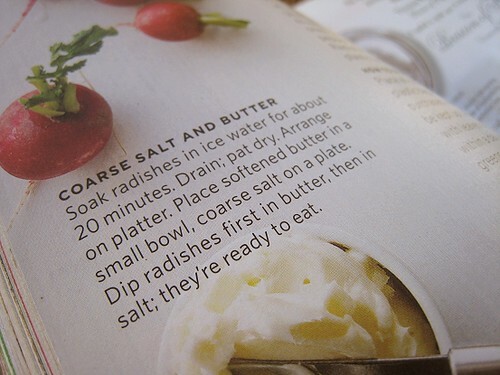 It was quite difficult to find a cookbook that actually had recipes for radishes, it turned out. But, among the cracks and crevices of our cookbook shelves was a May 2006 copy of Everyday Food. It had a whole section on radishes! 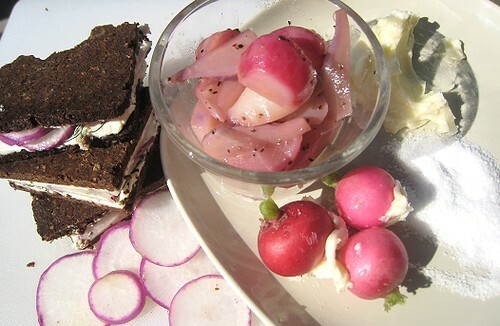 So, we divided our puny little bunch of radishes into three and made crudités, radish tea sandwiches and glazed radishes. So I did... yeah, what that says above. 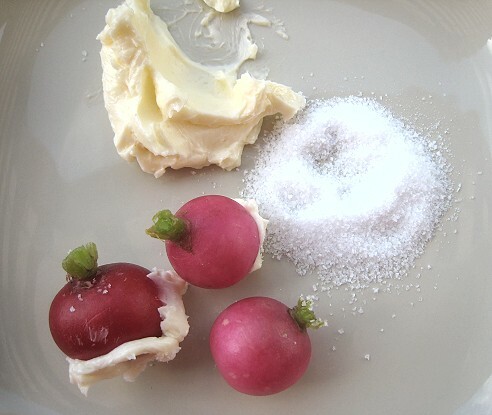 After a refreshing bath, into butter and coarse salt the little radishes went. Here they are in some mood lighting. 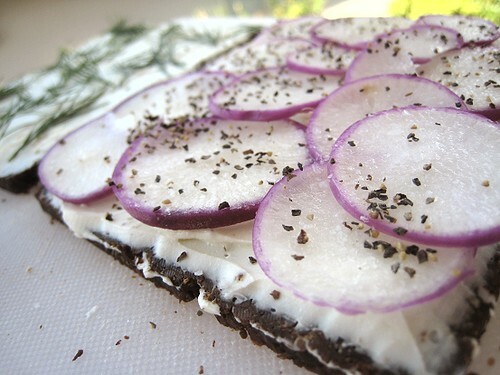 For the radish tea sandwiches, I needed thinly-sliced radishes. 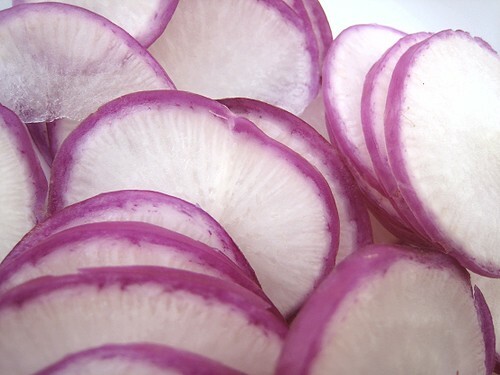 Sliced radishes are inherently pretty! 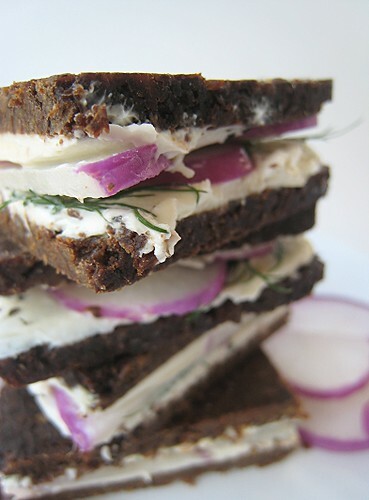 I spread cream cheese on pumpernickel bread, then layered the sliced radishes. We didn't have lettuce on hand, so I forwent that and added some dill instead. Seasoned with salt & pepper, of course. The pumpernickel bread may be an acquired taste. I didn't realize it was a little bit "fruit-cake-y" in texture and taste. There's beet syrup in it! One learns something new everyday. It was perfectly all right filled with the cream cheese and radishes. Beets are another "exotic" vegetable for us. And they kind of look like bigger radishes. Or is it radishii? Last, but not the least, the glazed radishes. 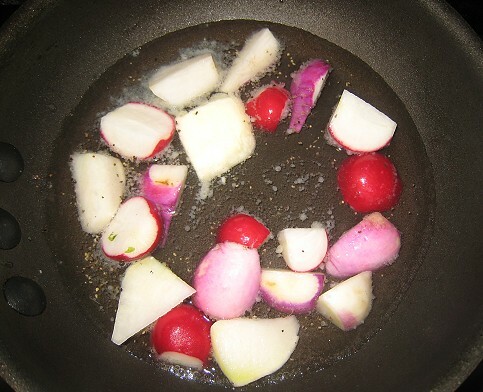 The radishes cooked until tender and until the liquid evaporated and turned into a glaze. 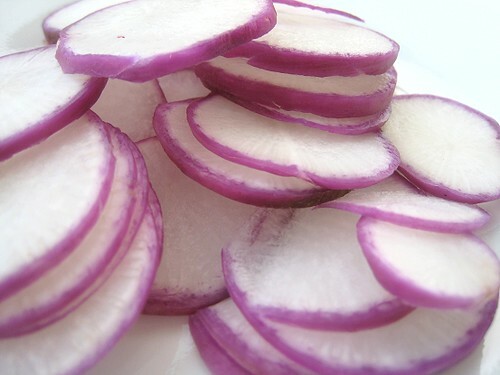 I like the radishes very much. It is quite similar in taste to the Asian daikon variety, so the flavour was not unfamiliar. 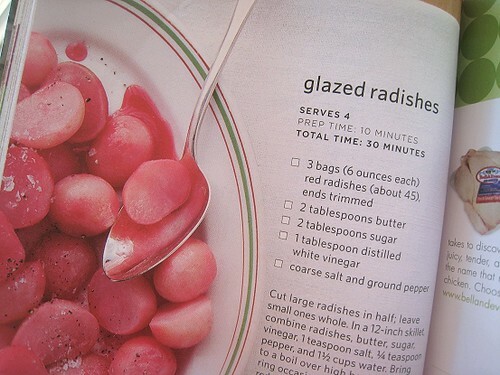 I loved the glazed radishes and I am already thinking how we can use that as a side dish for a meal yet to be contemplated. The radish sandwiches were also quite good and I can certainly imagine myself making myself some. It is fairly easy enough to prepare, which is the best thing. As TS said, the pumpernickel I have second thoughts about, because it tasted like fruit cake to me. But other breads will fill in nicely. Our best wishes are with Michelle! More info on First Thursdays at Thursday Night Smackdown. Cooked radishes were actually quite the new discovery at our house. 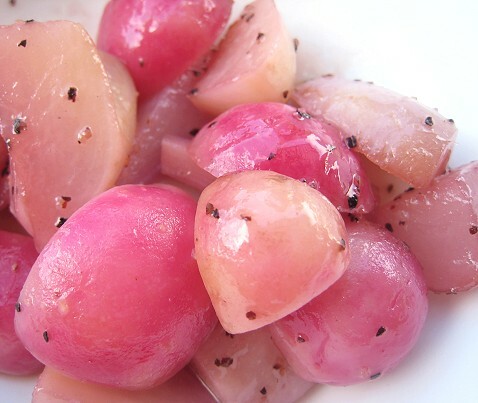 We'd used raw radishes pretty extensively, but found that they were simply LOVELY when roasted. I'm loving the easy glaze you used here, and will have to try it out! Wow - you made these look really, really good. 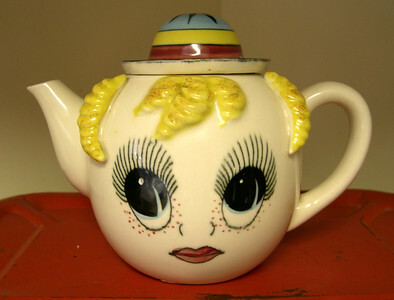 The tea sanwiches look lovely. 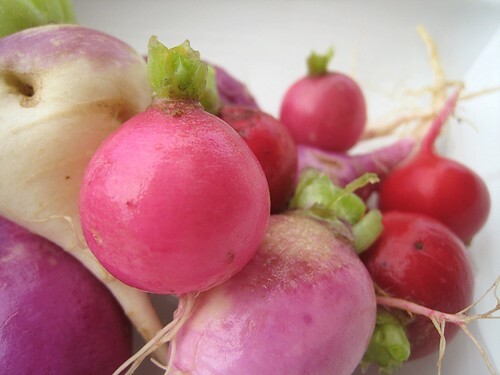 I'll have to think about the glazed radishes because I really like the peppery-ness of a radish. Were they very sweet? 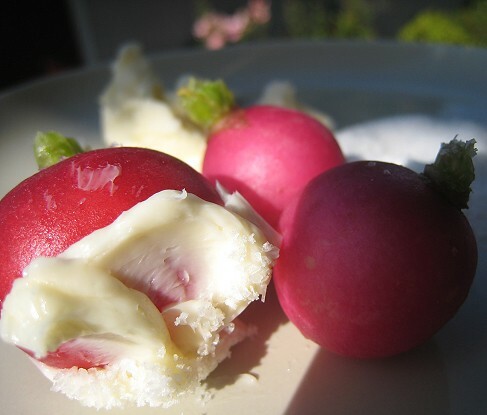 I grew up on radishes split open with butter and salt but I love all these variations! The "group" picture is great! Beautiful job on the trio! I'm not familiar with using radishes much but you've opened up some ideas for me! 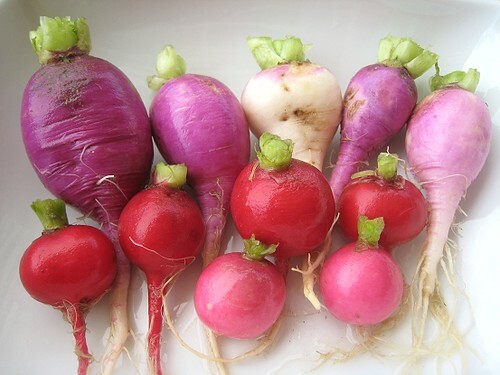 I love the different hues of the radishes. The glazed ones are my favourite. Well, I would never have thought that I could fall in love with radishes...three brilliant recipes! I love pumpernickel bread! 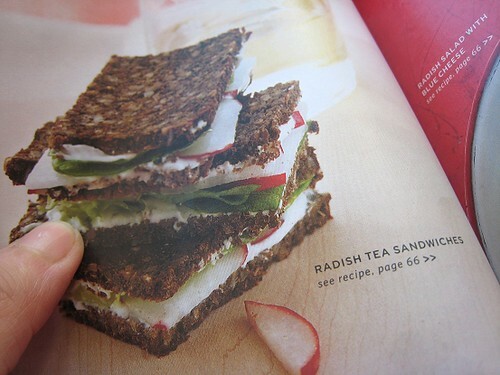 And I like the idea of radish sandwich, another must try soon. Great looking food as usual! I make radish sandwiches on a sliced baguette with lots of cold, sweet butter. The dense rye bread looks good too! I've never had radishes in anything but a salad or two. I hated them when I was a kid, but think my tastes might have changed by now. I like those tea sandwiches, I'll have to give them a try. oh, brilliant for the TNS. What wonderful colors. I kind of faked my color. Radishes are one of those vegetables that I have to pause and admire their beauty everytime I have them. Sure, go and feed my radish addiction. I can't resist a beautiful radish. They still definitely retained their radish-ness. You can decrease the amount of sugar and increase the butter. (Oooh, butter!) The sugar is just needed to make a syrupy consistency. These look delicious! 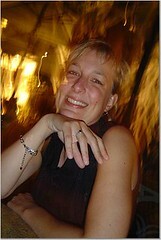 I’m trying to incorporate more raw veggies into my diet and found you on foodgawker. Thanks for sharing!